Things you need in order to write: Diet Coke, a bit of chocolate, and lots of quiet. Things that hamper your writing: E-mails and phone calls. Favorite music: Beach Boys, Rolling Stones. I saw both groups in concert this past year. Have tickets, will travel! Music that makes your ears bleed: Polka music. Really guys, just really. Favorite beverage: Good French red wine. Something that gives you a pickle face: Cheap white wine. Something you’re really good at: Marketing. I have a knack for knowing exactly how to promote a product. Something you’re really bad at: Anything mechanical. Even a mousetrap baffles me. Last best thing you ate: Truffle pizza. Last thing you regret eating: 99 cent taco. But not because it didn’t taste good. Things you always put in your books: Dogs. Things you never put in your books: S – E – X. My cozy mysteries are G-rated, good for girls to grandmas. Things to say to an author: Hi, will you sign my book? Things to say to an author if you want to be fictionally killed off in the next book: Hi, when is your book coming out in paperback? Favorite places you’ve been: Paris, London, Hong Kong, Bali. Places you never want to go again: Beijing (because of the dangerous air quality!). Favorite genre: Mysteries, thrillers, history, art history – basically all books. Books you would ban: None. I don’t believe in banning books. Things that make you happy: Hearing from all my readers. They are my biggest inspiration to keep coming up with inventive and crazy new plots. Things that drive you crazy: People who think I really don’t have to work at this. Most embarrassing moment: Not getting picked for softball in 5th grade. Proudest moment: Making the New York Times bestseller list – then doing it again and again. Biggest mistake: Should have bought more real estate. Most daring thing you’ve ever done: I started my own advertising agency when I was 29. All these older art directors and account guys warned me not to – they said it was too risky. At the end of my first year, I was earning twice what they were. Something you chickened out from doing: Parachuting with my Uncle Bob to celebrate his 90th birthday. 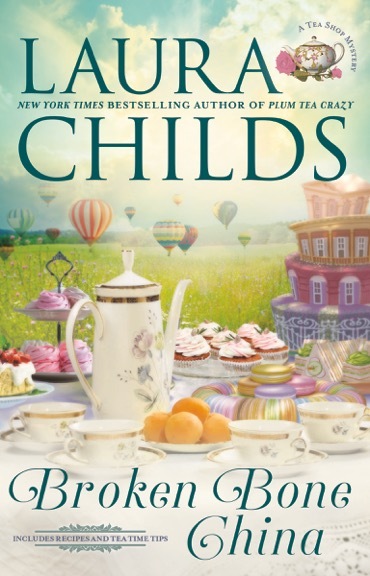 Laura Childs is the New York Times, USA Today, and Publisher’s Weekly bestselling author of the Tea Shop Mysteries, Scrapbooking Mysteries, and Cackleberry Club Mysteries. 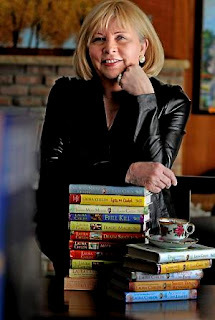 Recently, Book Riot named her mysteries to their list of “25 of the All Time Best Cozy Mystery Series.” In her previous life Laura was CEO of her own marketing firm, authored several screenplays, and produced a reality TV show. She is married to Dr. Bob, a professor of Chinese art history, enjoys travel, and has two Chinese Shar-Pei dogs.